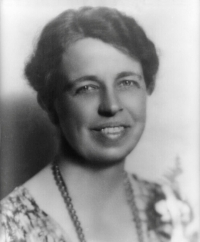 Dubbed “The First Lady of the World” by Harry Truman, Eleanor Roosevelt held the post of first lady of the United States from March 1933, when her husband Franklin D. Roosevelt was inaugurated as president, until April 1945 when he died during his fourth term in office. She was thus the longest serving first lady in the history of the United States. As first lady, Eleanor transformed that role from social hostess to an active political partnership with her husband. She was a champion of civil rights, an advocate for women, and supported government funded programs for the arts. This first lady will be portrayed by Craig Schermer, a graduate of John Carroll University with a major in Russian Imperial History. He has studied the first ladies most of his life and spent nearly 10 years as the historian for the National First Ladies’ Library in Canton, Ohio. Mr. Schermer’s charming and informative portrayal of Mrs. Roosevelt will be held on Sunday, Feb. 10, at 2:00 p.m. A reception with light refreshments will follow his hour-long presentation and give attendees an opportunity to meet Mr. Schermer and ask questions. Reserved seat tickets are $20 and can be purchased in person or by phone (440-331-0403) at the box office Wednesday through Saturday, 1:00-6:00 p.m., or by visiting clagueplayhouse.org.